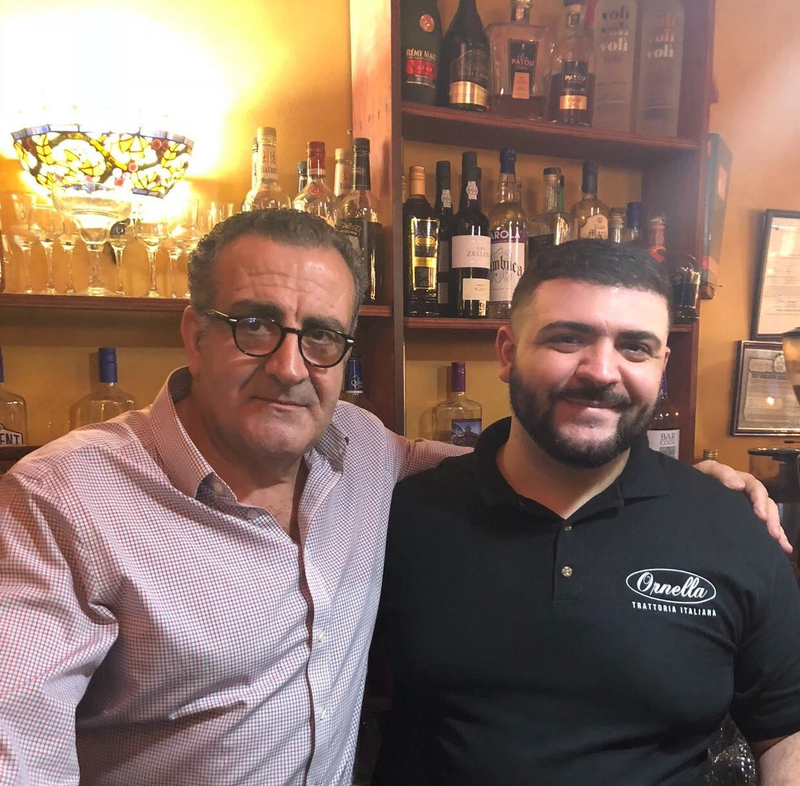 This is Giuseppe Viterale (pictured left with his son Angelo, right), the owner of Ornella Trattoria Italiana, an Italian restaurant named after his wife, Ornella, who he met by chance one evening as he was walking down the street in Williamsburg and offered his hand to help when he saw her slip on some ice. Their unique encounter, which sounds like the beginning of a romance movie, is not uncommon for Giuseppe, who shapes his restaurant around just that principle: uniqueness. Giuseppe grew up on a farm in a small village in Salerno, Italy. His father owned a flour mill, which he and his siblings helped run, so his earliest memories are connected to food. At the time, Giuseppe says, he didn’t even realize that he was involved in the food industry because it was the only world he knew, one where everything went directly from the farm to their table. However, Giuseppe had no intention of getting into the food and restaurant business. He had bigger dreams for himself and began studying architecture. But after failing his certification test the first time, he decided to take a few months off and go to New York for a little adventure and fun. He wanted to see a different part of the world and be immersed in a new culture where he knew no one and didn’t speak the language. He was in New York for a few months when he met Ornella on the street that night and as soon as he could, he went back to Italy and passed his architecture test before returning to New York again and getting married. 30 years later, Giuseppe has created an Italian restaurant that’s known for it’s fresh ingredients, uncommon dishes and philosophical yet engrossing owner. When he returned to New York, Giuseppe began working with a big construction company but got laid off during the recession in the early 90’s. He had to continue to work to support his family so he went to a staffing agency, which placed him at a job in a restaurant in Greenwich Village. Although he had grown up surrounded by food, he had never worked in the restaurant business before and it was much different than the food-related world that he knew. He decided that if he was going to work in this industry, he didn’t want to embarrass himself with his lack of experience so he started from scratch and began training at many different restaurants, learning as he went. Once he felt like he had a good understanding of different restaurants and how they operate, he spent a few months working at a restaurant in Brooklyn Heights. Things were going well there until one day, when he was standing outside the restaurant, a bum passed by and asked him what he was doing there. When Giuseppe responded that he was working, the bum laughed and told him that if he wanted to make real money, he had to work in Manhattan. So Giuseppe took his advice, left his job in Brooklyn Heights and asked the agency to find him a job in the city. The staffing agency placed him at Cellini, an upscale Italian restaurant where he quickly excelled. He started out as a waiter and after a month, had become their head waiter. A year after that, he became the restaurant’s manager and maitre d. Giuseppe ended up working at Cellini for 15 years, during which time he used his background in architecture to study the real estate market and invest in Brooklyn, slowing purchasing about 50 residential rental properties. Eventually it got to the point that he was doing so well at Cellini and in his real estate ventures that he had to choose to focus on one and shockingly, decided to stay in the food industry. Over the years, his passion for the industry (specifically the restaurant operations, the workers and the customers) had started to grow and he couldn’t leave it. And then Giuseppe got the opportunity to open his own restaurant. Someone he had met during his time at Cellini was looking to open a new restaurant and wanted Giuseppe to run it. Giuseppe was excited for this new endeavor but unfortunately, the business didn’t make it more than a year before it closed. In order to pay the bills and make up for the money he had lost, Giuseppe was forced to sell some of his real estate properties, but instead of getting frustrated with the situation, he decided to start over and open a restaurant his way. He found a small restaurant in Astoria for sale in the paper, went to see it a few times, bought it and then put all of the experience he had learned in his childhood and throughout his life into action. He hired a bunch of cooks, rather than one chef, and started creating recipes based off of the food and flavors he knew from the dishes his mother had cooked on their farm. And in 2010, Ornella Trattoria Italiana officially opened. Giuseppe’s uniqueness extends from his recipes to the restaurant itself. One of his hobbies is carpentry so all of the tables and chairs in his restaurant were made by him as well as the sign outside the restaurant. And rather than buy his ingredients from a food supplier, Giuseppe goes to the market every morning and buys what he needs for that day. Although buying from a supplier would be easier, Giuseppe doesn’t like that you can’t control the quality of the items that you receive and buying the items himself allows him to keep his food cost low. It also allows him to get ideas for new dishes that he can create if he sees produce he’s never used before that he can try out as a special for that day. And even though people may think that he runs his business in an “old-fashioned way” because he runs it with his sons (Giovanni, Angelo and Pino), Giuseppe understands that in order to connect with his customers, he needs to create an experience around his food. Which is why the first thing he does in the morning is check his social media, where he frequently posts videos showing how he created a new dish or curing meat at his farmhouse in the Catskills. He also doesn’t ignore negative reviews on Yelp like most restaurant owners. Instead he responds to them and uses it as a marketing tool, creating wallpaper in the restaurant’s bathroom with print outs of the negative reviews, which he says makes most customers laugh and even attracts customers because he says what people want to say but don’t. Because he’s so established in Astoria, he’s not worried about a lack of customers. He has so many positive reviews that he can afford to deal with the negative ones. It’s more important to him that he’s authentic because his customers appreciate his personality. For Giuseppe, the most important thing that he sets out to do is deliver good food to his customers. But he hopes that people connect with his business because it’s memorable. From food to furniture, he doesn’t like anything in his restaurant to be “standard” and does everything in his power to create a unique brand that allows him to stand out from other Italian restaurants. He believes that people don’t remember the recipe for a dish they ate but they remember the story of the person behind the food and the atmosphere that they’ve created. His sons understand this mission and now help him run the business, which gives Giuseppe more time to experiment with dishes at his farm upstate, where he plans to build a greenhouse this year. Moving forward, he’s hoping that he can more deeply connect the restaurant to his farmhouse and bring it more in contact with nature to further influence the way he cooks. He wants to use his food to remind people that nature is where everything comes from and that we need to be more in touch with it. He’s hoping that his focus on nature’s impact and his unconventional branding will keep customers coming back to his restaurant. Next Entry:DIY Game Day Snacks!